MEDIA ROOTS – Abby and Robbie Martin grew up in Pleasanton, CA, a city located ten miles from the Lawrence Livermore Lab (LLL), a secret nuclear weapons production facility. They initially set out to explore the psychological impacts of taking nuclear testing into virtual space. But as their investigation unfolded, they found that the LLL—in conjunction with Site 300—has built an impressive greenwashing PR campaign cloaking a dark reality. Despite a moratorium on nuclear testing, the nuclear arms race continues unabated at very high costs. In addition to the startling cases of LLL's mismanagement of dangerous materials and 'accidental' releases, the facilities are still testing every radioactive component of a nuclear bomb in open air, according to sources. Childhood cancer rates are six times higher for children born in Livermore; and the amount of radiation that has been expelled from the lab since its inception is equivalent to that released from the bombing of Hiroshima. Most disturbingly, the Livermore community is largely unaware of what the lab is actually doing and what its potential impacts are on its health and the environment. I appreciated how much you covered in such a short clip. Many good questions were asked that should get straight answers in an open society. As urban growth continues to surround this facility, more people will uncover the Cold War legacy of LLL. Nice presentation Abby! 7man on Tue, 03/13/2012 - 7:41pm. Michael Moore has competition. Well done. Simple Truths on Wed, 03/14/2012 - 2:52am. 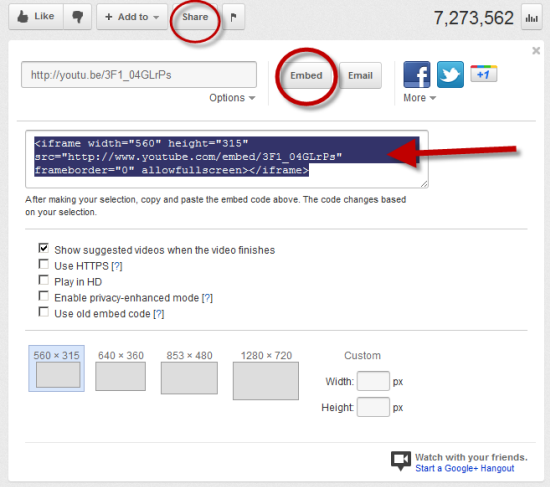 Use the iframe option for video embedding (don't click, "Use old embed code") ... that way people can play the HTML 5 version of your video and don't need Flash per se. The iframe embed code will choose automatically. See also this, this, this and this. The last two aren't as important as the first two. In the end, you gotta realize Youtube will take your videos down at their whim and at the direction of whoever influential tells them to. We've seen it with Alex Jones plenty of times. Not that I'm a fan, but it's censorship just the same. The web is replete with dead links to YT videos taken down. Glad to see you're starting to do some hard-hitting independent investigative journalism. Good luck. Raise hell. SnowCrash on Wed, 03/14/2012 - 3:34am. Thanks so much for all the support, feedback and advice, It's much appreciated! Abby on Wed, 03/14/2012 - 6:48am. When I see this blatant disregard for public safety I wonder if there is a hidden agenda. After reading THE REPORT FROM IRON MOUNTAIN a few years ago, my view of the world changed. I can now see that many of these deliberate pollution schemes are one small part of a larger eugenics plan. Yes, they are doing this on purpose because they believe in the end it will improve the species. Too bad that many will die from cancer. Too bad! This is the cost of progress. Another example is the effort to get fluoride spread around so a contamination event is harder to pinpoint. Same idea-- improvement of the species through culling of the weak. Just look at the use of DU in war zones. Do you think this hasn't been thought through a million times by RAND and other think tanks? Is it just coincidence that India and China are downwind from Iraq and Afghanistan? In the short run, people don't give a damn as long as they have a paycheck. There are plenty of people who worked at Hanford, Pantex, Savannah River and all the rest who refuse to see any connection to the rise of cancer. You think it just a coincidence that Fort Detrick and the National Cancer Institute (NCI) are only 25 miles apart? With the Human Genome Project smack dab in the middle? That the NCI is on the same campus as the National Institutes of Health? Come on! It boils down to so much necessary, unavoidable, collateral damage. So sorry. Move on. Forget about the dead, bury the toxic waste or sell it as compost for gardeners, expand the chemically driven "health care system" to deal with the inevitable sickness, collect the data, fiddle with the gene pool. kawika on Wed, 03/14/2012 - 9:49am. Orangutan. on Thu, 03/15/2012 - 12:48am.